he Sino-Soviet Union (SSU) is the newest playable faction in Dust Tactics! This world power has been in the middle of the global struggle for years. Now, for the first time, you have the chance build your very own SSU force and crush your enemies. With the addition of this faction, immediately supported by a five unit expansions, the global conflict inDust Tactics grows even more intense. In addition to powerful units for the SSU, the Operation “Zverograd” campaign provides the SSU backstory along with scenarios and rules to get started. Rumors of a great mystery in the bowels of the city began, piquing the curiosity of both the Axis and the Allies, and soon the city was besieged from both of the SSU’s enemies. With Zverograd under constant attack, the SSU High Command is willing to pay any price to maintain a hold on the city; however, the Axis and Allies have made this broken city the center of their attention. The only question now is who will discover the mysteries buried beneath Zverograd? With Operation “Zverograd” comes the first SSU hero, the Russian legend Koshka Rudinova and her personally customized walker“Grand’ma.” Koshka is renowned for her knowledge of hand-to-hand combat and also has respectable skills with a gun. With that in mind,“Grand’ma” was designed with a strong mix of close assault weapons and long range fire support. 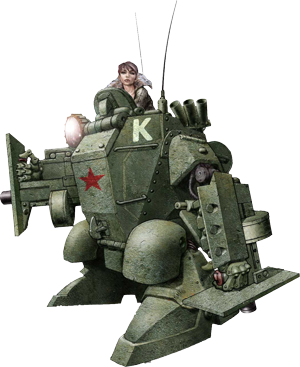 Moreover, Koshkais a new type of hero that starts the game inside of her walker, and if it is destroyed, Koshka can continue to fight on foot. With several other abilities, this is an thrilling introductory hero for the SSU. To protect Zverograd and the whole of the motherland, the SSU employs their own unique armored machines. At one point in the war, the Soviets lagged far behind in walker technology, and the Axis walkers were able to dominate many early battles between the two factions. However, with the aid of stolen technology and captured engineers, as well as some improvements of their own, the SSU walkers are now competitive with anything their opponents may field. TheKV47, the most versatile walker in the SSU arsenal, can be specialized for any type of combat role from urban assault, to long-ranged fire support. The Nadya bathes enemies of the motherland in flames with its twin Sulfur Throwers, theNatasha blasts away using the dual cannons, and the Natalya cuts apart anything within arm’s reach with two Combat Saws. 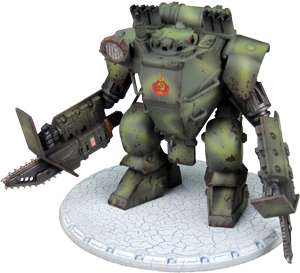 With these walkers, the SSU is prepared to match their armor against anything their rivals may field. 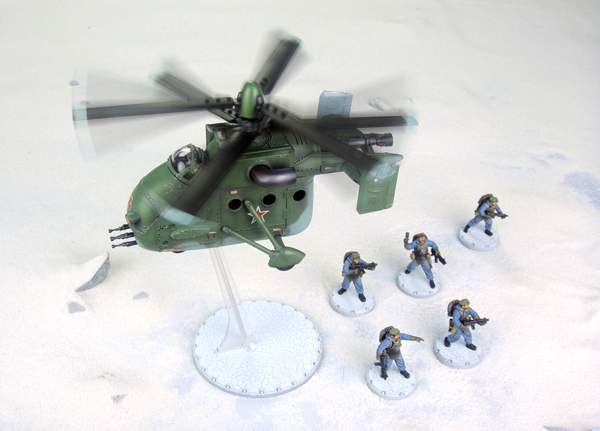 Yet another SSU advantage is their airborne transport, the first flying unit in Dust Tactics. Their SSU Airborne Transportallows them to mobilize troops quicker than their counterparts, moving reinforcements to the thickest parts of the battle. In addition to transporting units, this vehicle provides fire support with its quad machine guns. The SSU specializes in rapid assaults and coordinated attacks; however, without the SSU Airborne Transport, those assaults would be nearly impossible. Since this is the first airborne unit in Dust Tactics, enemy commanders will have to develop new strategies to deal with this ariel threat. Moreover, this expansion comes with an entire squad of Chinese Volunteers in order to get your new transport immediately into the action. Soldiers in the SSU army are among the most hearty in the world. No other army has been as successful fighting in harsh conditions, and this has helped the SSU develop a strength in scouting out potential fields of battle. The bitter cold winter has often proved to be a most reliable ally, and it has transformed Russian soldiers into some of the most stubborn and resourceful troops around. Whether they are hurling home-made Molotov Cocktails in close-quarters combat, or sniping the enemy from afar, any commander would be proud to have soldiers with as much ingenuity and determination as the soldiers that comprise the SSU fighting force. However, if any soldier should question his loyalty to the cause, Kommissars, political soldiers tasked with maintaining the blocs ideology, help “remind” soldiers what they are fighting for. In game, the SSU command Squad has access to the same skills other command squads use, but they have better weapons than their adversaries. Since they armed with a Power Tool, they can provide additional anti-armor attacks if the need arises. The SSU also has the SSU Close Combat Squads and the SSU Battle Squads. The Close Combat Squad uses Molotov Cocktails and a Flamethrower to engulf their enemies in flames, while the Battle Squad keeps its distance and pummels the enemy in machine gun fire. The soldiers of the SSU now find themselves fighting on multiple fronts both familiar and unfamiliar. Looking for revenge on the Allied powers for holding ceasefire talks with the Axis powers, the SSU invaded North America on two fronts. On the Alaskan front, the SSU capitalized on their familiarity with cold-weather conflicts and quickly captured a foothold, but now faces strong resistance from American forces. In Florida, they were surprised by the unfamiliar swamp lands that have claimed as many soldiers as American rifles have, but the fighting still continues despite the foreign terrain. In addition, the SSU is engaged in multiple conflicts across the globe. Fighting continues in Eastern Europe and Russia, the Pacific, Southeast Asia, and Africa. With so many conflicts, the SSU faces a real danger of spreading themselves too thin, but leaders of the bloc have devoted every available resource to these conflicts, and pursue victory with a grim determination. Join the struggle and bring honor and conquest to the motherland. The SSU faction features infantry, walkers, heroes, and even the first Dust Tactics airborne unit, and will be fully playable with the release of the first wave of expansions. Gather your forces and get ready to use new units and strategies to crush your adversaries!